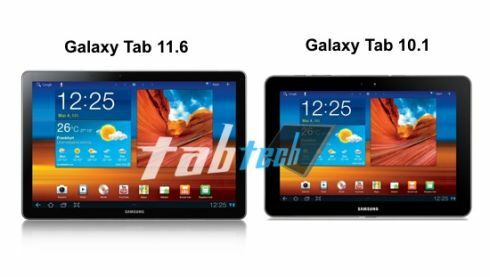 We deal with mockups, renders and prototypes here at Concept Phones, not only designs, so after showing you the Galaxy Tab 11.6 idea from a couple of days ago, now we have a new mockup from the German site TabTech.de. They report that Samsung will introduce this 11.6 inch tablet at MWC 2012 and they give us this mockup for comparison sake, with the Galaxy Tab 10.1. Rumors say we’re dealing with a dual core 2GHz Exynos 5250 tablet, with a 11.6 inch display that supports a 2560 x 1600 pixel resolution and runs Android 4.0 Ice Cream Sandwich. The S Pen stylus is also expected to be supported and bundled here and I’m guessing that we’re going to get a 5 or 8 megapixel camera, 16/32GB of internal memory, LTE, NFC, WiFi, GPS, DLNA and as few ports as possible, keeping with the Samsung tradition of the Galaxy Tab 10.1 and 8.9. What I’m worried about is how portable this device will be, considering its diagonal size. If it’s anywhere below 650 grams, it will be OK and it’s less than 9mm thick we’re saved… and I trust Samsung to deliver that. On the previous Samsung Galaxy Tab 11.6 concept I’ve shown you some comments said that they’d rather have a big, not so portable device, but all the performance they need. Do you agree?